Skinner® SuperGreens™ is a delicious enriched pasta with 5 green vegetables*: Spinach, Zucchini, Broccoli, Parsley and Kale. With 3 servings of vegetables in every 3.5oz (100g) portion, Skinner® SuperGreens™ is a great addition to your family's healthy lifestyle. 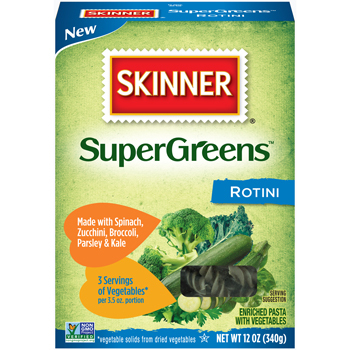 Skinner® SuperGreens™ is also a good source of fiber and 5 vitamins and minerals. Add some green to your mealtime and be sure to try Skinner® SuperGreens™ Rotini in your favorite entrees, side dishes, oven bakes and salads. SEMOLINA (WHEAT), DURUM FLOUR (WHEAT), DRIED VEGETABLES (SPINACH, ZUCCHINI, BROCCOLI, PARSLEY, KALE), NIACIN, FERROUS SULFATE (IRON), THIAMIN MONONITRATE, RIBOFLAVIN, FOLIC ACID.